After last year's successful race that saw Nacer Bouhanni win three stages and the points jersey, FDJ will have a more low-key line-up in this year's edition of the Giro d'Italia. 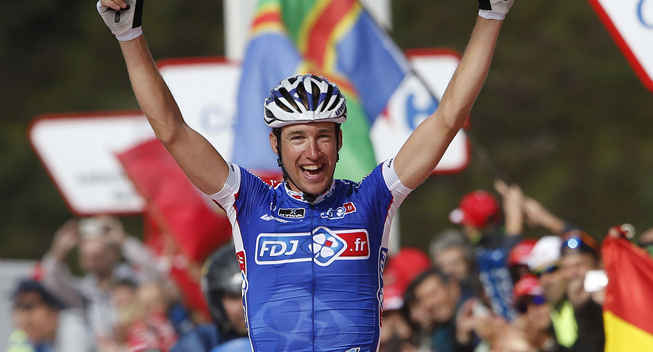 The team will be led by Alexandre Geniez who will try to improve on last year's 13th place and make it into the top 10. He recently showed good form when he won the Tro Bro Leon and got close to victory in the Tour du Finistere He will be able to count on Kenny Elissonde and Francis Mourey in the mountains but will be without Arnold Jeannesson who crashed in the GP de la Somme and will have to skip the race. His spot has been taken by Anthony Roux who will join forces with Kevin Reza and Murilo Fischer to form a block of fast riders. Reza will probably be the protected sprinter and will mainly target some of the harder stages. The team will be completed by loyal domestiques Jussi Veikkanen, Arnaud Courteille and Cedric Pineau.